Graphic Recording from the 2016 Welfare Food Challenge Town Hall. By Tiare Jung. People who want much higher welfare rates took over Vancouver City Council Chambers on Sunday, October 23. They gathered to talk about what it was like to eat on just $18 a week, and what needs to be done about the dire poverty that the BC government is forcing people on welfare to endure. However, the takeover was helped by the city that donated the space and passed a proclamation declaring last week, Raise the Rates week. October 16–22 was the 5th annual Welfare Food Challenge. This year over 200 people from all parts of BC participated. Tiare Jung recorded the highlights and actions items in this graphic recording. Click the image to see a larger version. 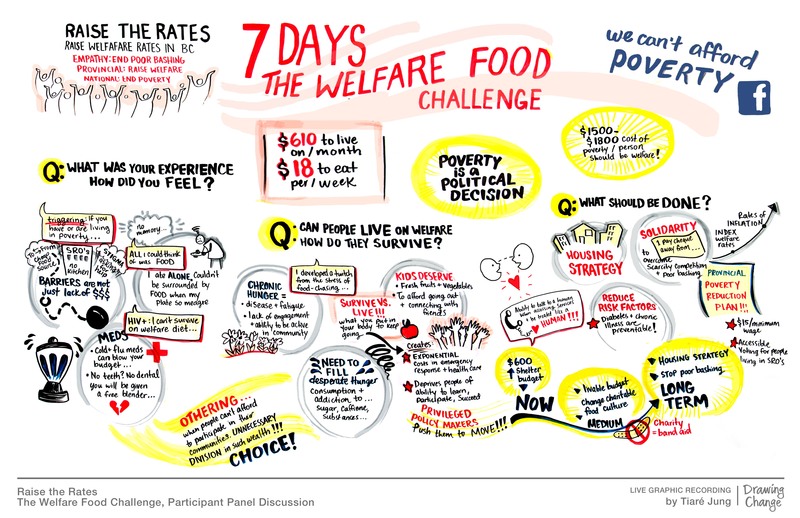 Graphic Recording from the 2016 Welfare Food Challenge Town Hall By Tiare Jung. Click image for a larger version. Increase Income Assistance Rates to the Market Basket Measure. This is approximately $1,500 a month in Vancouver, for a single person. Once welfare has been raised to the poverty line, the rates must be indexed to inflation.